2006 Pontiac GTOs. Lot 24 of 29. CLICK-> We have all the years lined up here. The 2006 Brazen Orange, 2005 Phantom Black, and 2004 Torrid Red GTOs. You can tell them apart from the rear pretty easily. The 2004 only has two small exhaust pipes exiting out the driver's side rear. The 2005 comes with split dual exhaust and bright red tail lights. The 2006 has the same exhaust as the 2005 but blackened tail lights. CLICK-> Here are the three years of GTOs from the front. The Torrid Red 2004 on the far left has been fitted with a 2005 GTO hood. The Phantom Black 2005 and Brazen Orange 2006 both have 18 inch wheels while the Torrid Red 2004 has the standard 17 inch wheels. CLICK-> Dean spotted this fresh new Spice Red 2006 GTO at a dealership in San Diego, California. Spice Red is a new color for the 2006 GTO. It only comes with the black leather interior. Those are 2005 GTOs in the row behind it. CLICK-> Spice Red 2006 GTO, left front view. The car next to it is Torrid Red which is the other red paint offered in 2006. CLICK-> It's a Phantom Black 2006 GTO! See the blackened tail lights! Or is it? - compare with this image from the recent past showing an '05 car. Now that is wild how they reversed that existing image. CLICK-> Here is a pre-production 2006 GTO in the new Brazen Orange Metallic paint! Besides the new paint, this one sports a set of the new 18 inch wheels. These pictures were sent in by Jay from the Kansas City Pontiac Motorsports Club. CLICK-> Brazen Orange 2006 GTO, right side view. This car comes standard with black leather seats with orange stitching and fusion orange gauges. CLICK-> Brazen Orange 2006 GTO, right rear view. Here you can see the blackened tail lights that have been added for the 2006 model year. CLICK-> This is a Quicksilver 2006 GTO. It is very similar to the 2005 GTO with the standard 400hp LS2 engine, 4 speed automatic or optional 6-speed manual transmission, rear wheel drive, hood scoops, rear decklid spoiler, and split dual exhausts. So what is different from the 2005 GTO? There are four new items for the 2006 GTO: an additional power outlet (cigarette lighter), illuminated radio control switches on the steering wheel, darkened rear tail lamps, and faster power seats. Compare this view to a Quicksilver 2005 GTO. Not much of a difference. There are new paint color offerings for the 2006 GTO. They have added a orange called Brazen (or Fusion) Orange Metallic and a dark red called Spice Red Metallic. They dropped the Yellow Jacket and Midnight Blue colors from the 2005 GTO. Check them out in our Stat Explorer (tm). We have this shot in two additional sizes; 800-600 wallpaper and 1024-768 wallpaper. CLICK-> Quicksilver 2006 GTO, right rear view. We have a rear decklid spoiler standard and split dual exhausts with chrome tips. The rear tail lights have been blacked. Compare the rear of a 2005 GTO. We also have this shot in two additional sizes; 800-600 wallpaper and 1024-768 wallpaper. CLICK-> Here is a close-up of those new rear tail lights that have been blackened for the 2006 GTO model. People have been purchasing blackened tail lights for their 2005 GTOs. It's gonna be real hard to tell the difference between the two years from the outside. You'll have to check inside and look for the extra power outlet. 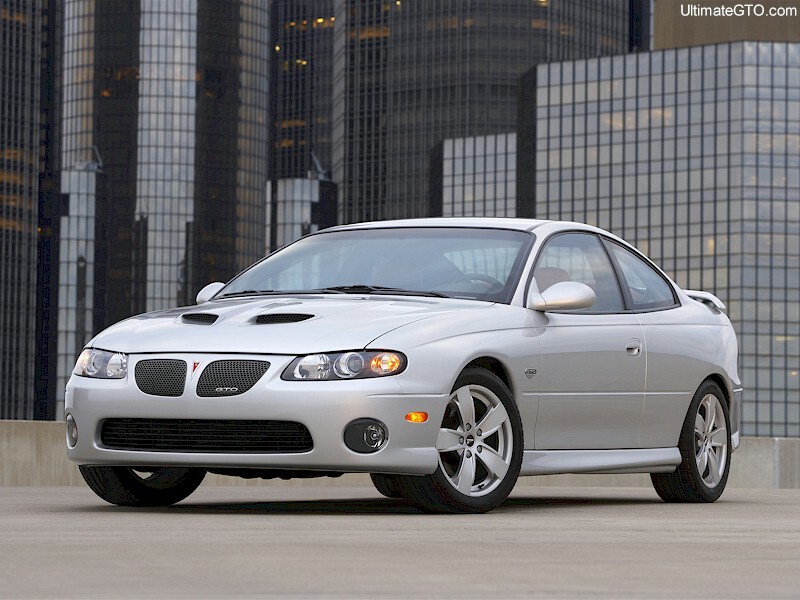 CLICK-> As with the 2005 GTO, the 2006 GTO comes with the 400hp 6.0L LS2 V8 engine. This thing has 400 ft-lbs of torque as well. 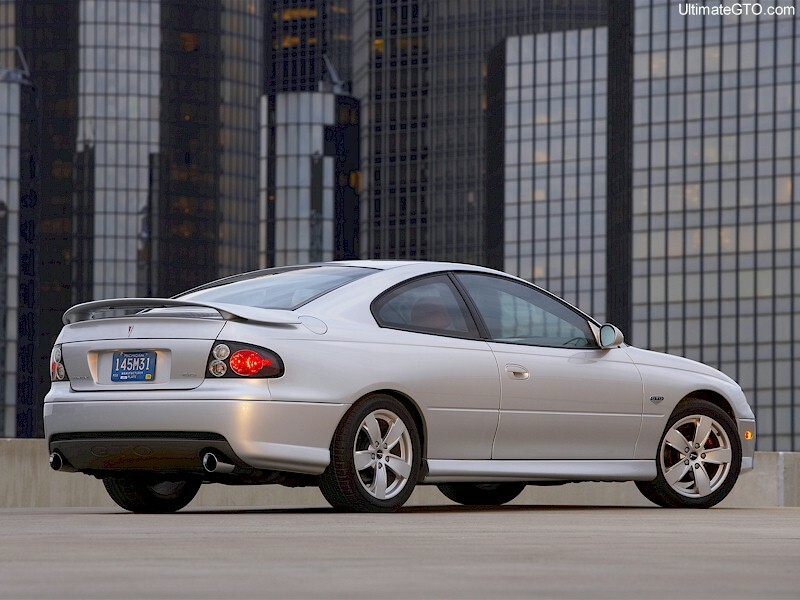 CLICK-> Let's take a peek at the 2006 LS2 out of the GTO. Key LS2 V-8 features include: aluminum block casting with 4.00-inch cylinder bores and optimized oil galleries, high airflow aluminum cylinder heads, flat-top piston design with low ring tension for reduced friction, floating piston wrist pins that help maintain quiet engine operation, high-efficiency low-energy ignition coils, 10.9:1 compression ratio, large 90-mm single-blade throttle body, reduced-mass water pump design, and a powerful engine controller that incorporates all electronic throttle control functions. This baby has a 6500 rpm redline. This thing is pretty quick when combined with their 4-speed automatic or 6-speed manual connected to the 3.46 axle. Check out our Top Speed Calculator loaded with standard 2006 GTO drivetrain specs. CLICK-> This is the optional 6-speed manual transmission that you can get when you order a 2006 GTO. It's a Tremec T-56 M12. Beside the 2006 GTO you can get this transmission in the 2006 Cadillac CTS-V.
CLICK-> Here is the 4-speed automatic transmission that comes standard with the 2006 GTO. It's a Hydra-Matic 4L60-E M32. This one is used in many 2006 GM models such as the Chevrolet Silverado 1500, Chevrolet Silverado 2500, GMC Sierra 1500, GMC Sierra 2500, Chevrolet Tahoe, Cadillac Escalade, Cadillac Escalade EXT, Chevrolet SSR, GMC Sierra Denali, GMC Yukon, GMC Yukon XL Denali, Hummer H2, and Hummer H2 SUT.